1. 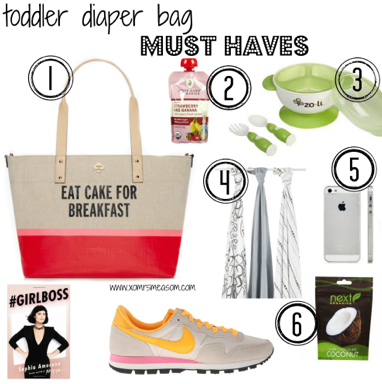 Having the right bag is very important as far as diaper bags go. You need one with lots of storage space, and some pockets to keep things easily accessible. You don't want to throw something in there, and have it be a giant black hole. I have certainly had those moments where I feel like I am digging for what seems to be an eternity, and turning up quite literally empty handed. That's never any fun, and especially when I have to dump my whole diaper bag out to find his favorite teething toy. This Kate Spade bag (found here) is perfect, and on sale! So hurry. 2. Be sure to pack snacks or even a meal. Having something as handy as fruit pouch can save you a hunger tantrum mid walk. Personally, we love Peter Rabbit's brand (found here). Since DC was little that's been a staple, and he loves the strawberry banana (it was the first pouch he ever tried). Yum, yum! 3. Packing utensils and a bowl of your own is also very important if you are practicing baby led weaning like we are. DC loves to try and feed himself, and occasionally just gnaws on a spoon! This Zoli to go set (found here) is awesome, and makes packing him some fruit, veggies, and a protein super easy. Why? It suctions to the table! No more spills, and no more mess. 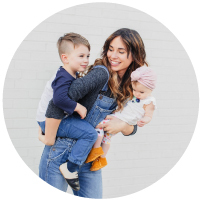 Up top for this toddler must have mommas! I just ordered this bad boy, and am pretty stoked! 4. I always pack a muslin blanket to use for either keeping my little warm (i swear the air conditioner is always blasting in public places), or to wipe him clean. There is always one in the wash because we abuse these poor blankets! I love my Aden + Anais blankets (found here) because they are soft, and perfect for my son's gentle baby skin. 5. Be sure and pack toys or books! Anything to help keep them entertained, even if it's an app on your iPhone! If they are teething, chew toys are key! A friend of mine introduced me to "chewbeads" (found here), and they are honestly ah-mazing! We like to keep books in the car, and Where the Wild Things Are (found here) seems kinda rad for any age! Heck, I'll read it for myself! 6. I like to have a little snack for me! I mean I can't have this huge bag, and not a single munch-n-crunch for momma! After all, I am running after a toddler now, so I need a little sustenance right? At least, that's what I like to tell myself. omg diapers in a plastic bag. WHY have i not thought of this before. Godsend! thank youu for the tip miss mama.